This page is being developed to reflect local awareness of the need for the sustainable use of materials, and recycling. 44% of domestic waste is currently recycled, placing Mid Devon 26th best in the country. RECYCLING COLLECTIONS - Click here for info. and dates on recycling and refuse collection. Also check out HERE local ideas on recycling from Prof. Hogwash and others! Composting waste sites at Ashley on the Tiverton/Bickleigh road, and at Brushford - both will also take other types of materials for recycling. In your garden: Nearly a third of Devon dustbin waste is compostable - so if you have a garden, get a compost bin or join brown bin system. Do you catch rainwater for use in the garden? Do you do your watering in the early morning or evening to reduce evaporation? Do you mulch your plants to conserve water in the soil? Do you take green rubbish to the recycling facilities? Energy Saving Trust. How to make your home more energy efficient. The trust was set up in 1992 as a response to the Earth Summit in Rio. Use It Again! 50% of waste could be re-cycled, but we manage only about 9%. Can you help by recycling more? 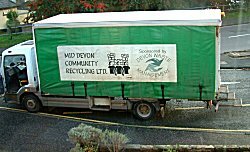 Devon Community Recycling Network - information and a timetable of kerbside recycling days in your area. Uffculme in the Culm valley, not far from Bampton, has a very well-used community recycling site. The site of the Composting Association with many helpful hints. Garden waste, kitchen waste, and cardboard. NO PLASTIC. Newspapers, magazines, paper, glass bottles and jars, tins and cans, card, cardboard drinks cartons, aluminium foil, plastic milk bottles, plastic carrier bags, clothes and shoes. NB You can now recycle domestic batteries on black box days. i.e. disposable nappies, polystyrene, plastic-lined containers, anything NOT listed above.